Last season, Le’Veon Bell suffered a horrific MCL injury in Pittsburgh’s 16-10 defeat to the Cincinnati Bengals in November – an unfortunate incident that would keep him out of the side for the rest of the season. And at the business end of the season, the Steelers struggled to move the ball as easily and Bell’s impact in both the passing and running game was sorely missed. 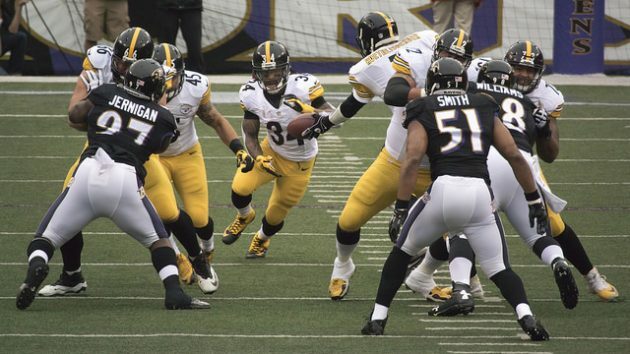 However, that’s not to say DeAngelo Williams did a bad job. In fact, he did a fantastic job whilst Bell was side-lined and Pittsburgh head coach Mike Tomlin should definitely consider using both men in a dual-back formation next season. The former Carolina Panthers star recorded 907 yards on the ground last year as well as 367 yards through the air – statistics that show just how vital he was to Pittsburgh’s offense. And without a shadow of a doubt, Tomlin should adopt an aggressive approach on offense again this season. With both Bell and Williams coming out of the backfield, it will keep the opposing defences guessing and gives quarterback Ben Roethlisberger more options if needed. With Heath Miller now retired and Martavis Bryant suspended for the year, the Steelers plan to line up in various systems and formations next season. As of July 21st, Pittsburgh are 11/1 to win the Super Bowl in Paddy Power’s NFL odds and the two running backs will be key to their chances of glory in 2017. Yes, defence is the most important thing when trying to build a championship-winning side but a solid running game is also central to success in the National Football League. The game is already dominated by pass-heavy franchises but a reliable rushing unit can reap rewards. Perhaps the greatest thing about using both backs is that they complement each other perfectly. Bell is an agile, versatile back – capable of catching out of the backfield and using his own athleticism to turn a negative play into a positive one. Meanwhile, Williams is more of a ‘north-south’ running back but does possess the skillset to juke and catch opposing defencemen off-guard. Ultimately, the Steelers may have the best running back duo in the NFL on their hands – and Tomlin knows it. Pittsburgh are the most successful franchise in NFL history and Mike Tomlin will be keen to enhance his legacy at Heinz Field with another Super Bowl success. Ben Roethlisberger isn’t getting any younger and the time to win could be at hand. Whilst Pittsburgh’s defence is still fairly young, their offense could power through matches next season – especially if Tomlin uses both Bell and Williams. 2 Comments on "Le’Veon Bell’s Return Is Great, But Tomlin Shouldn’t Ignore DeAngelo Williams"
The Steelers won’t ignore DeAngelo Williams. They won’t ignore Stingily, Richardson, and Toussaint, either. As noted in previous posts by the regulars here, Bell’s knee remains a question mark and Williams is 34 years old. Both are one hit away from retirement. Unless Colbert signs fresh talent when the league rosters are cut, it looks like the young RBs are going to get a lot of work this year.